I’ve said it before and I’ll say it again, I can’t believe we’re already back around to holiday season!!! 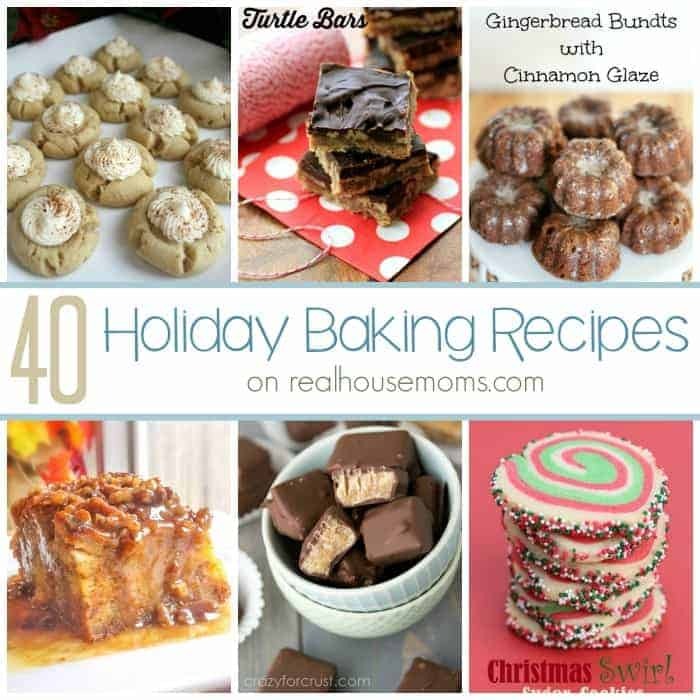 At Real Housemoms we’ve got you covered thanks to the RH Team and this amazing HOLIDAY BAKING RECIPES & GIVEAWAY!!! When the holidays roll around again we start to think and plan all the yummy treats we want to make to share with our friends and family. This time of year more people head into the kitchen to make some super fantastic memories. RH wants to help you make this holiday season one to remember, so we’re bringing you this amazing baking guide and giveaway. Just think of all the memories and delicious yummies you can make with a new mixer from KitchenAid, Dessert Mash-Ups cookbook from Dorothy Kern of Crazy for Crust, and all these other awesome baking supplies, not to mention that cash for whatever else you may need! Not only that but we’ve got a spectacular guide to the favorite holiday baking recipes from the RH team here in one place for you. 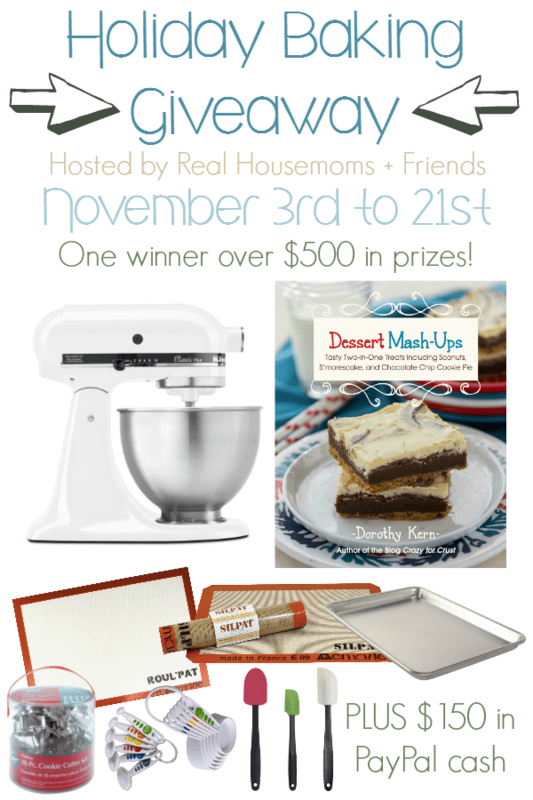 Be sure that you click through for your holiday inspiration after you’ve entered to win this awesome baking package prize! Then in the spirit of giving, share this post with your friends and family on Facebook, Twitter or whatever you’d like! The more the merrier right! My favorite Holiday Treat is always some form of chocolate chip cookies, right out of the oven! I love any treat that has pomegranate seeds in them! My favorite holiday treat is Baked Alaska! My favorite holiday treat would have to be cheesecake. My favorite holiday treat is one that has been in my family and handed down for generations…walnut and poppy seed filled strudel! Christmas cookies of all kinds ! My favorite holiday treat is homemade eggnog. i love baking my Great-great grandma’s Sugar cookie. It’s nothing like the rolled in sugar kind we all think of. This one is less sweet but every bite reminds me of the generations of bakers who poured love into their baking. My favorite holiday recipe is Frog Eye Salad. We have it any time there is a family get together and any left-overs disappear along with whatever bowl it’s in! My daughter has about 4 of 5 bowls she needs to return!! Love the recipes! Seem easy enough for me to do! My favorite holiday treat cherry cheesecake! My favorite holiday treat is Butterscotch Squares Copycat Recipe. My favorite holiday treat is decorated sugar cookies! Thank you for the wonderful giveaway. My family’s favorite holiday treat is peanut butter fudge with milk chocolate topping! I love a good lemon meringue pie. Oh my goodness! I can’t wait to try all these amazing recipes!!!!! My Grandma”s peanut butter fudge and cherry pie recipes! It doesn’t matter if I make them, or someone else, I just have to have them! ALL of them haha. But during the holidays, I LOVE all of my Mama’s homemade pies (from my Grandma’s recipes). There is the Dutch Apple Pie, Custard Pie, and Lemon Meringue Pie 🙂 Thanks for this contest. I can’t wait to try some of these recipes! MY favorite holiday treat is my grandma’s cutout cookie recipe who she got from her grandma. I always think about her when I bake and decorate them. I love Pecan Pie or my favorite and I don’t know if it is considered a dessert is Sweet Potato Souffle or casserole!!!!! Favorite holiday treat is the family recipe for hard fudge. Yum! I love the idea of the Christmas Swirl Sugar Cookies and Raspberry Cheesecake. My mom always made the best peanut brittle and peanut butter fudge for the holidays, just a couple of my favorites for Christmas! Favorite holiday treat is any homemade candy that my children and I make! Especially pulling taffy, pecan brittle, and truffles! Yummy!! My favorite holiday treat is fudge or cinnamon popcorn. Give this girl anything chocolate or pies!! My favorite holiday dessert is anything with pumpkin…I LOVE PUMPKIN!!! My favorite holiday treat is white chocolate covered pretzels rolled in crushed peppermint! I try to recreate every year. I’t’s still never as good as hers…. What a GREAT giveaway for this time of year. THANKS!!! My favorite holiday treat is ice cream peppermint torte! My favorite holiday treat is my Gramie’s Deep Dish Apple Pudding. Molasses sugar cookies are a Christmas favorite around my house too. Just the smell of the dough puts me right in the mood. Thanks to much for the chance to enter, hoping I’m lucky! I love fudge in all kinds of flavors. I also really enjoy the Peanut Butter Blossom cookies my sister makes only at Christmas. Frosted cut-out sugar cookies with sprinkles! my favorite time to bake. I love the combination of peppermint and chocolate! I love, love LOVE peanut butter balls!!!! It doesn’t feel like Christmas until I’m eating a canoli! Boiled custard and cheesecake are my favs!! Anything with chocolate and peanut butter. My favorite holiday treat is the homemade Santa bread that I make for my grandsons each year! I love making frosted cut out cookies. My favorite holiday treats are peanut butter fudge and 7 layer magic bars. Love all the recipes. Thanks! My favorite holiday treat is homemade reeses cups! All these recipes look delicious! Oh, this would be an awesome gift to my son! He has been studying cooking for 2 years now and wants to be a chef when he grows up. His entire lesson plans center around working towards culinary school, and this would give him such a boost of confidence and happiness. Thank you for this opportunity! Great recipes!! Would love to win!! Who couldn’t use a new Kitchen- Aid! I would love a new Kitchen-Aid! Christmas cookies my favorites both to make,eat & give as gifts. Favorite Holiday treat is good old cutout sugar cookies. My favorite is homemade fudge. Raisin pie, made just for my brother and I.
I would like to try so many of these!! Pretty much all of them. To pick just one though, I think the Christmas swirl ones look yummy and like the most fun to make, especially with my little ones! My favorite holiday treatbis making Snowball cookies (Mexican Wedding Cakes) with my kids like I used to with my Mom for a cookie exchange. Love cookie dough cheesecake bars! Homemade Coconut Crème Pie !!!! My holiday Day Treat is Homemade Coconut Crème Pie. chocolate fudge, I try to stay away from it the rest of the year and then end up eating way too much during Christmas! My favorite holiday treat is decorated sugar cookies. My favorite treat is my mother’s chocolate marshmallow roll. My favorite treat is my cheesecake with homemade salted caramel. I am all about pepparkakor cookies during the holidays!! Any kind of COOKIE or pumpkin roll!